Apple has raised a series of objections to Samsung's proposed exhibits intended for use during cross examination today, accusing the company of repeatedly creating evidence that is distorted, obscured or otherwise misleading while also raising false objections to Apple's own evidence. Among the objections Apple raised was an exhibit created by Samsung that the company described as "misleading" because Samsung had altered the "accused devices" to "remove the screen, which may distract the jury from the asserted design," added graphics "that obscure portions of the accused devices, distracting from the overall impression of the accused designs," used images that "are not to scale or are misleadingly scaled," and "only show partial views of the asserted designs and trade dress." 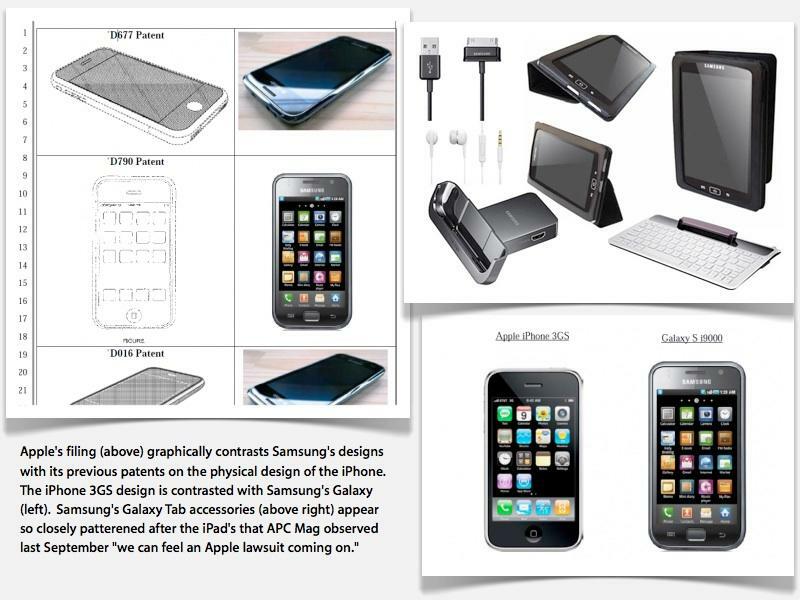 In regard to a slide comparing iPhone 3GS to "several Samsung accused products," Samsung complained back that "there is nothing misleading or distracting because Samsung merely whites out the screen to allow a comparison of the overall design without that element, and then a comparison of the distinct features and the top and bottom of the phone." A comparison of the two devices with the screen visible would clearly not be in Samsung's interest when defending against Apple's arguments that it has "slavishly copied" the iPhone. 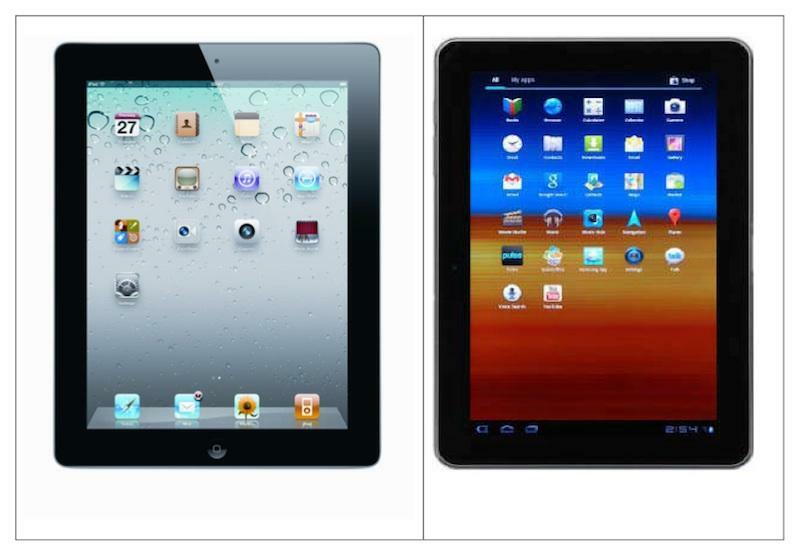 Recent testimony from Apple's iOS head Scott Forestall noted how Samsung had "copied many of the icons we created. they copied them blatantly and directly," specifically noting examples such as the merge call button. One Samsung exhibit Apple accused of being "misleading and confusing" because it compared "the D'305 patent and a photograph of a Samsung phone that includes the body style that is not accused of infringing the D'305 patent." Apple complained that another exhibit proposed by Samsung was misleading because "the scale of the D'899 patent is enlarged to make it appear substantially thicker than the accused Galaxy Tab 10.1." Last August, Samsung itself raised the claim that Apple had "reportedly doctored evidence" in Germany after an Android enthusiast blogger accused the iPad maker of using images that depicted the Galaxy Tab as having a screen ratio closer to the iPad that it did (below). In that case however, the screen ratio used by Samsung was not at issue. Instead, Apple's claims described a strategic effort by Samsung to "slavishly imitate" Apple's striking product designs in a way that violates Apple's "valuable commercial rights." Apple also took issue with how Samsung was presenting its own objections related to witness exhibits and demonstratives. "Rather than objecting only to the limited supplemental witness disclosures and Mr Forstall's materials," Apple stated in a filing, "Samsung re-objected and added new objections for all five of these witnesses' direct exhibits and demonstratives. "Samsung disclosed its objections late at night (at 12:26 am), forcing Apple to scramble to meet the Thursday 8:00 am briefing deadline. Yet upon request, Samsung refused to identify the specific objections that it intended to brief within the parties' five page limit." Apple's filing further added "Samsung's 'object a lot, but vaguely' approach misled the Court into sustaining many of its objections —including barebones, "untimely disclosed' ones that were patently false."